If you’re in the midst of planning your wedding, you must be browsing everywhere online websites, social media channels to local magazines to know the latest wedding catering trends. Let’s say this brings in a lot for the wedding planners and caterers. From bold, vibrant colors, floral installations and unique desert walls- there’s a lot in store. Check out some of the latest trends for wedding catering in 2019. Seasonal food items – Unsure what all you want cuisines you want for your wedding? Let you wedding date decide this. Seasons are a great inspiration for wedding catering. Have a winter wedding? Stick to hot meal with hearty food items. Your guests would surely love it. Another trend which is in full bloom is the love for Indian food. 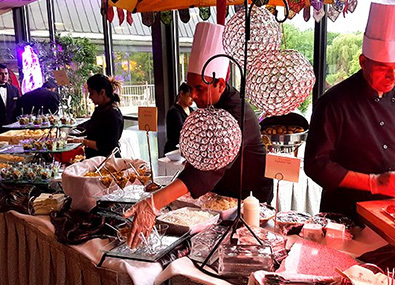 There might be many Indian caterers for wedding in Long Island, New Jersey, Connecticut and NYC. But it’s important you choose your caterer wisely. Small plates- One trend that we see couples are loving is opting for a menu made up of five to seven smaller dishes than a traditional three course wedding meal. It gives a more luxurious feel to your menu and it can also be very well tailored as per your budget. You can also incorporate your favorite dishes in the menu. More desserts – It used be that the only desserts you use to get a wedding were a slice of cake with a coffee at the end of the meal. But now that’s changing. A growing trend in desert tables has been seen in last few years. Food vans – This is a new catering trend for weddings and is a great alternative to traditional wedding catering. Food vans come in versatile shapes, sizes and offer multiple cuisines. Guests just love this new approach of catering. Their growing popularity makes them a great option for outdoor weddings irrespective of what weather it is. Special counter for kids – If you have lot of kids in your guests, then make life easy for you and for them by having a separate catering counter for them. Chocolate puddings, sweets tarts are obviously children’s favorite but you can go more innovative. Get live pizza counter, a pasta station, and milkshakes are easy ways to impress the little ones. Interactive food counters – Bring some innovation to food on your big day. Interactive food counters are a great way to make your guests praise the amazing food stations. Build your own pizza or food stations similar to it can be a perfect way to indulge your guests with their food. Still looking for Indian caterers wedding in Long Island, New Jersey, Connecticut or NYC? Call us at: 212-967-0400. Be it a wedding, destination wedding or a private party catering, we have exclusive customized catering packages for each event.